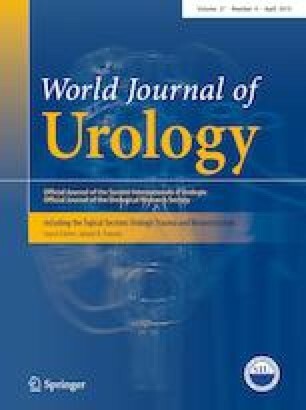 Comparison of multiparametric and biparametric MRI of the prostate: are gadolinium-based contrast agents needed for routine examinations? To investigate, if and how omitting gadolinium-based contrast agents (GBCA) and dynamic contrast-enhanced imaging (DCE) influences diagnostic accuracy and tumor detection rates of prostate MRI. In this retrospective study, 236 patients were included. The results of biparametric (bpMRI) and multiparametric magnetic resonance imaging (mpMRI) were compared using the PI-RADS version 2 scoring system. The distribution of lesions to PIRADS score levels, tumor detection rates, diagnostic accuracy and RoC analysis were calculated and compared to the results of histopathological analysis or 5-year follow-up for benign findings. Omitting DCE changed PI-RADS scores in 9.75% of patients, increasing the number of PI-RADS 3 scores by 8.89% when compared to mpMRI. No change of more than one score level was observed. BpMRI did not show significant differences in diagnostic accuracy or tumor detection rates. (AuC of 0.914 vs 0.917 in ROC analysis). Of 135 prostate carcinomas (PCa), 94.07% were scored identically, and 5.93% were downgraded only from PI-RADS 4 to PI-RADS 3 by bpMRI. All of them were low-grade PCa with Gleason Score 6 or 7a. No changes were observed for PCa ≥ 7b. Omitting DCE did not lead to significant differences in diagnostic accuracy or tumor detection rates when using the PI-RADS 2 scoring system. According to these data, it seems reasonable to use a biparametric approach for initial routine prostate MRI. This could decrease examination time and reduce costs without significantly lowering the diagnostic accuracy. Daniel Junker and Fabian Steinkohl equally contributed for this work. DJ protocol and project development, data analysis, manuscript writing. FS manuscript writing and editing, data analysis. VF data collection, manuscript editing. JB data collection, data management. TT data collection, data management. FA project development, data collection. TRWH manuscript editing, interpretation of data. MR manuscript writing, critical revision of the manuscript. UN manuscript writing and editing, interpretation of data. The authors declare that they have no conflict of interest, nothing to declare. This is a retrospective study. Institutional review board approval was granted by means of a general waiver for studies with retrospective data analysis (Ethikkommission, Med. Univ. Innsbruck; 2009-02-20). All procedures performed were in accordance with the ethical standards of the institutional and/or national research committee and with the 1964 Helsinki Declaration and its later amendments or comparable ethical standards.